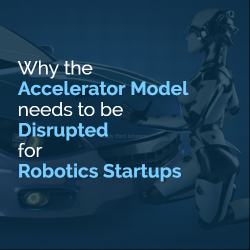 Startup Accelerator or Startup Escalator for Robotics Startups. Fady is the co-founder and partnerships director of MassRobotics; the largest robotics/automation innovation hub. Before that, he was the strategy, research & business development director of Vecna Technologies where he supported developing the company’s robotics R&D strategy, funding and commercialization activities. He was also the co-founder and strategist behind ePowerhouse's business model, go-to-market strategy, and customer acquisitions. Fady is a System Design & Management Fellow at MIT and focuses on designing and modeling startups as adaptive complex systems, and understanding the effect of entrepreneurship ecosystems on these startups' viability. Before MIT, Fady was the Lead Account Manager of Nokia Siemens Networks in North Africa and Europe where he led and managed multimillion-euro acquisitions and bids. He also consulted the World Bank on issues related to implementing industrial and entrepreneurship policies in developing countries. Fady is a regular speaker, panelist, and mentor at entrepreneurship events.